Fanjeaux was suffering from the Pyrenean effect with overcast skies today whereas, 50mls/80kms away, the Mediterranean coast near Narbonne was expecting clear weather. A good time to go and finally investigate an area we’d been meaning to look at for some years. I’d have said “perfect time” were it not for the fact that it’s a Sunday. Being a sunny July weekend, the locals would be flooding beach-wards and, being a Sunday, the restaurants would most likely be full of locals enjoying the traditional French Sunday lunch out with the family. Gruissan lies about 10mls/16kms south of Narbonne. There was, as expected, plenty of traffic on the autoroute but our journey was easy enough and cruise control got us there relaxed in about an hour. We even found a handy parking place which, given the traffic entering the town, had begun to be a bit of a concern. 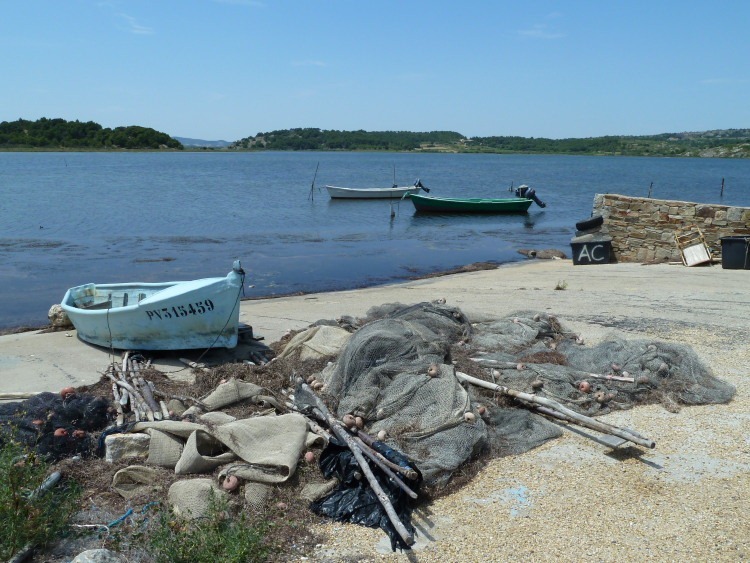 Gruissan itself, the old section, was as delightful little fishing port on one of the several lagoons in this area. As with many French towns, the ruins of a castle dominate the buildings which cluster beneath it. 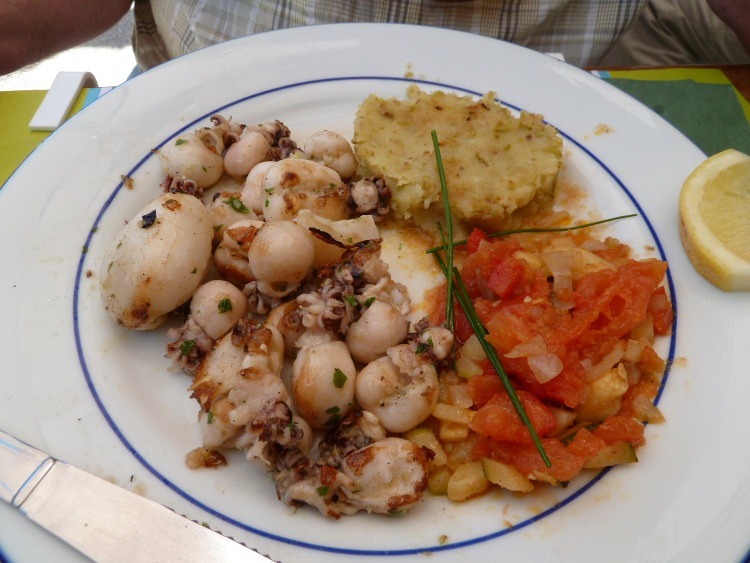 On a wander around the town studying a few menus, the local speciality appeared to be seiche à la plancha [griddled cuttlefish]. A la plancha is more usually associated with Spain but, hey, we weren’t that far from the border. Francine eventually spotted a restaurant with more appeal than most and, happily, with a spare table for two. We nabbed it. 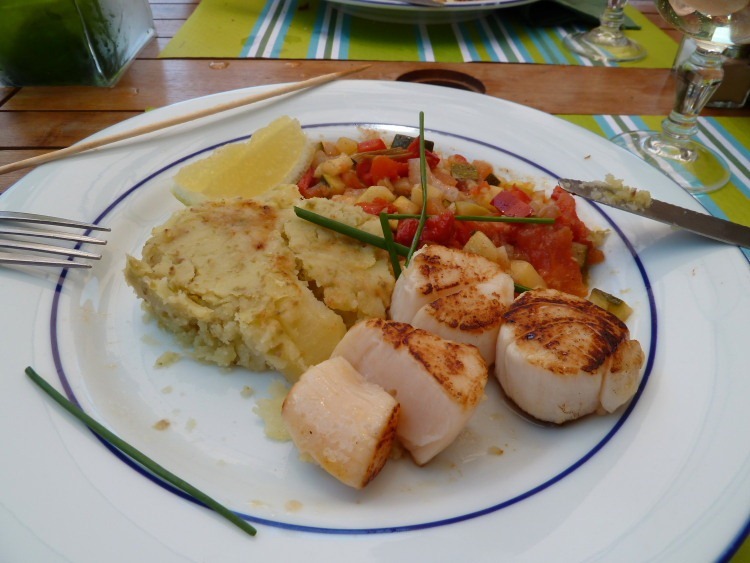 I had to try the seiche and Francine couldn’t resist a brochette de coquille St. Jacques [skewer of scallops]. 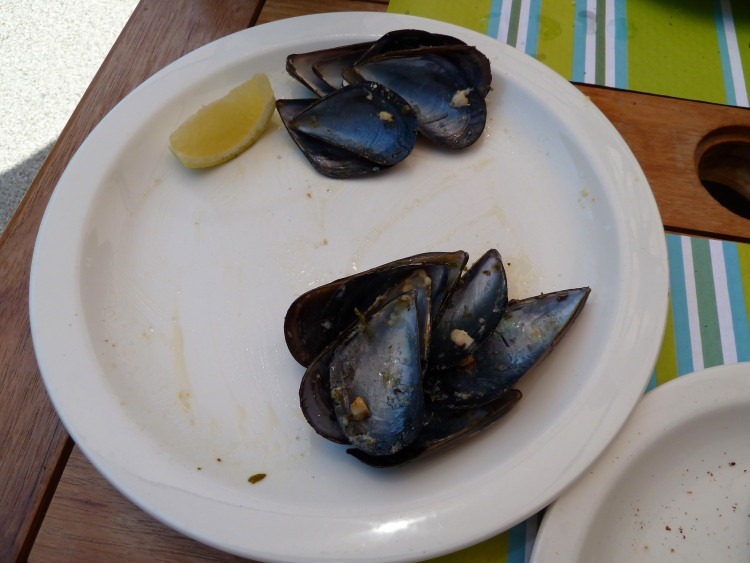 Just to get us in the mood, we shared a plate of grilled mussels as an aperitif but they were so good we finished them before the snappy camera could react. 😀 Francine’s scallops were excellent but my baby cuttlefish lacked something in the flavour department – a little disappointing. Nonetheless it was a very pleasant lunch and the four young French children on a nearby table behaved impeccably as their parents got on with the serious business of eating.